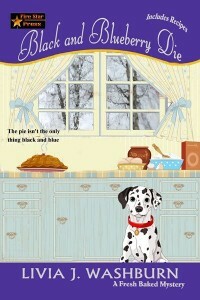 In the latest from the nationally bestselling author of The Candy Cane Cupcake Killer, Phyllis Newsom returns with a blackberry and blueberry pie recipe that’s to die for. It’s late summer in Weatherford, Texas and Mike Newsom’s childhood friend is sweltering in prison for a crime he claims he didn’t commit, murdering his wife. So instead of asking his mother to please stop investigating a murder, as he usually does, he asks her and Sam to please help his friend. Danny Jackson, found guilty of beating his wife Roxanne to death at the ritzy hair salon where she works, was sentenced to prison for 30 years. His pleas of innocence fell on deaf ears, so it’s up to Phyllis to find what actually happened. She finds there are a lot of secrets and lies being told, and Roxanne was in the middle of them all. Though Phyllis doesn’t want to get mixed up in another murder investigation, her son rarely asks for favors, and certainly not favors like this. She has to untangle the lies and comb out the facts to find what happened that dark night.